The Core Links feature on ReaderLinks allows you to create a set of links that you will always need for every book. This is an enormous time-saver, especially if you have many books. Imagine having to create links for your website, Facebook ads, Facebook posts, tweets, newsletter, and so on. One book wouldn’t be too tough to manage, but what if you have twenty books? That’s a lot of work. 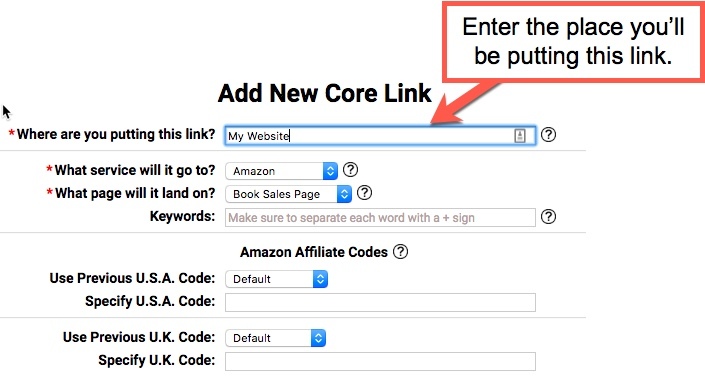 With Core Links you create those links just one time. ReaderLinks will automatically go into each of your existing books for you and add those links faster than lightning. Core Links will also be generated automatically for any new books you add to RL in the future. Zero labor required on your part. Plus, you can alter the Core Link and it will be updated throughout your entire library automatically! The only caveat to this is if you have directly changed a Core Link inside the book itself. That will convert the link to be a book-specific link for that book only. Check out the following image to see all of the basic elements of the Core Links area of ReaderLinks. Step 1: After clicking to add a new Core Link, you’ll be presented with a page that has all the necessary details to create the link. You want to put a description of where you’ll be putting this link. Note that this isn’t so much a naming of the link as it is where the link will be placed. The reason this is important is because you may have multiple links on your website, some for Amazon, some for Apple, etc. So think of this field as a bucket that contains all the links contained therein. Step 2: Next, select which service this link will connect to. You will notice that choosing different services will present you with different options on the form. Amazon has the most options, but others may only have the single option of simply ‘Service’. Step 3: Select the page you want the link to land upon when it reaches your chosen service. Again, the values available in this dropdown will change based on the service you selected. Step 4: If you’ve selected Amazon as the service, you’ll be able to enter keywords. Make sure you use the plus (+) sign in place of spaces. Step 5: If you selected Amazon as the service, you’ll be able to specify your Amazon Affiliate codes as well.